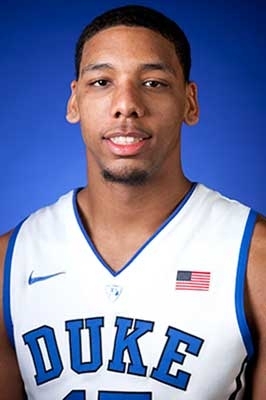 Okafor has arguably the best low-post game of any prospect in the country. He possesses an array of post moves along with prototypical size and length for a big man entering the NBA. These attributes combined with his strength, footwork, and ability to finish through contact make him an incredibly difficult one-on-one cover down on the block. Occasionally, he will take a midrange jumper if his defender is giving him space, but understands that his range doesn't extend beyond about 15 feet. Okafor's offensive game isn't limited to just his scoring, however. He's a willing passer out of double teams and generally maintains his composure when the second defender comes by immediately surveying the floor and holding the ball away from defenders with his long arms until he finds an open teammate. His massive, yet soft hands help him in multiple facets of the game, especially rebounding in traffic and catching virtually every pass that comes his way. Okafor is fantastic on offense, but it's a different story on the other end of the floor. Consistent effort on the defensive end is a major area for improvement for the 19-year-old. Far too often, he looks disinterested and fails to rotate over to protect the rim. There are times it seems like a lack of effort, although it could also be caused by his shortage of explosiveness. Overall, he's a decent athlete, but may need to improve that aspect at the next level. Another reason for inconsistent effort on defense could be a result of his conditioning. With his size and frame, some scouts worry about his ability to run the floor and play physical on a regular basis with other big men in the NBA without getting tired easily. One offensive component of Okafor's game that needs some work is his free throw shooting. At the charity stripe, his form is adequate, though it could use some polishing to improve his percentage, which would prevent defenders from fouling him hard to negate a shot around the rim and force him to make two free throws. Many people have thrown out a Tim Duncan comparison to Okafor because of his offensive skill set. However, even in his college days at Wake Forest, Duncan was a far superior defender. A more accurate comparison would be Al Jefferson of the Charlotte Hornets. Jefferson is a very skilled low-post player with excellent footwork. Like Okafor, he can be a bit lackadaisical on the defensive side of the ball and isn't a sensational defensive anchor and rim protector. The potential is there, though, for Okafor. If he puts in the work needed to improve his few deficiencies, he could be a perennial All-Star for many years to come.